Karaoke is not just great entertainment – it brings people together! It is the perfect activity for celebrations, conventions, office team-building events, picnics and holiday parties. 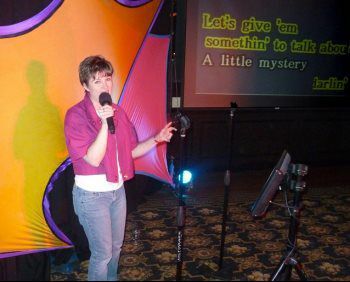 We’ve been hosting Chicagoland karaoke contests and special events since 1987! So yeah . . .your party is IN GREAT HANDS! Rock out solo, duo or boy-band style with up to 5 Sennheiser microphones. 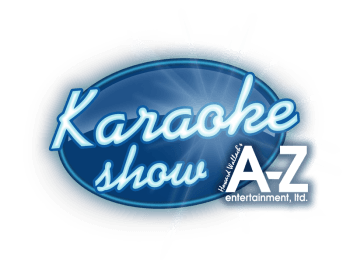 A-Z’s studio-quality sound system is packin’ singers’ monitors, karaoke screens and a crazy amount of fresh and classic hits – more than 25,000 song titles to choose from..
We host your karaoke night, making sure every singer sounds like a rock star, and will also serve as interactive DJ and MC. Brilliant lighting and theatric curtains will add real show sizzle! While you’re it - have us record your event and make the recordings available online and/or on CD! Instant Shenanigans . . . include our costumes & props to the mix too!